Dry or Hilarious Wit, Near the End. If you were to mention the name T.A.Dorgan with regard to boxing I think few people would have any clue as to who he was. However , the mention of the name TAD would elicit a very different response. 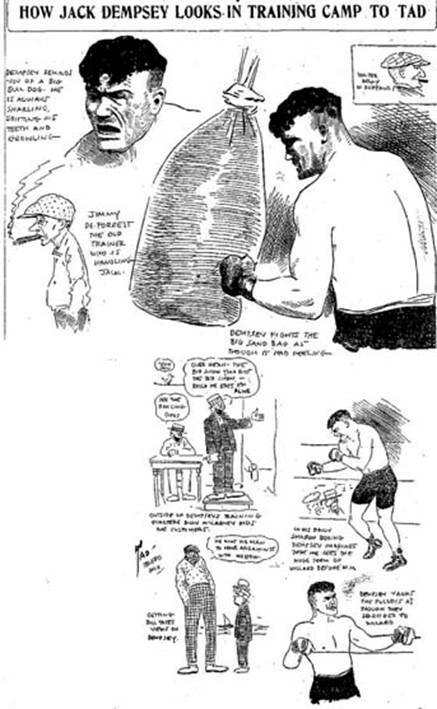 As a collector of old newspaper articles and cartoons I have long admired his work but not till very recently knew much about the man behind some of the best fight reports, and artwork, produced over some twenty or more years. No man ever loved life more tumultuous, zestful, jovial life. No man ever had a harder fight to live at all. And "Tad" is dead. His "dime-a-dozen ticker." as he called his ailing heart, has ticked out., But T. A. Dorgan, the cartoonist whose sense of humor raised him into a class by himself in the affections of young and old everywhere, wouldn't want any "tear squeezing" now. He hated "sob" stories about him when he was alive, and his astounding courage, his uproarious vitality in the face of extraordinary odds, tempted many a writer to play up the jinxes that Tad conquered. Tad had only one obsession—to keep as many people laughing, orat worst smiling, ns he could. Almost from the beginning of his career his cartoons took on. .They made people laugh at themselves and at their idols of Ring, Diamond and Turf. When he was a small baseball playing Mischievous kid on the side street sand Lots of San Francisco , Tad wanted to become a great pugilist. He followed John L. Sullivan and Jim Corbett along the streets, appropriately worshipful. Then he had an accident while playing around a house moving job that crushed off four fingers of his right hand. That ended his pugilistic aspirations- but it gave America a great cartoonist. Favorite protégé . Tad made millions laugh For twenty five years. He created his famous Animal characters, “Judge Rummy”, “Fedink”, “Reno Ruth” And “Bunk”, and he probably created more vigorous American Slang than any other man has – or ever will. Eight years ago the doctors told Tad that he’d have to withdraw completely from the life along Broadway, at the ringside and in the stands that he had taken part in so long and joyously. He shrugged and kept on Drawing his cartoons: for eight years of seclusion. During which he couldn’t even walk upstairs in his Great Neck, Long Island home he continued To keep his pen attuned to the pulse of life. few of his vast Audience knew that he was less active than in the past. Tad who’s phrases like “The cat’s pajamas” , “Yes, we have no bananas” , “cheaters”,“skimmers” and “as busy as a one armed paper hanger with the hives” ran from coast to coast and became virtually a part of the language was always fond of practical jokes. He could perpetrate them with an originality peculiarly his own. Again, Tad and Tom Powers, another famous cartoonist, once attended A six day bike race. On the way out early in the morning Tad got Into an altercation with a member of the crowd who was trying to Shove his way out too fast .Tad “socked” him and the man called the police. At the station house Tad gave his name as “Thomas Jones”. 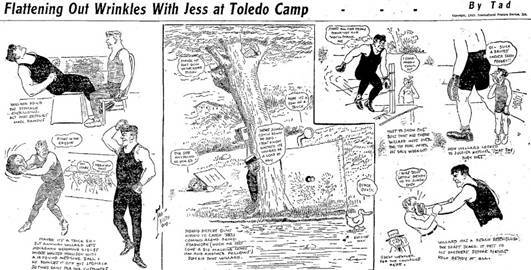 Later, when The jailer came round to let the cartoonist out – his adversary had not Pressed charges – Tad had forgotten his alias and didn’t respond When the name “Thomas Jones2 was called. He merely thought What a lucky fellow that man Jones was for being released. To the last Tad kept an atmosphere of laughter around him – as well as in the Myriad homes where his drawings and sharp running comment were enjoyed. Death may hover always at the door, and that was the case throughout those Sequestered long years, but Tad could laugh and think up collapsing glasses and dancing plates with which to surprise his wife and mother. He Out gamed death. and his created and popularised have gone into the language of the English speaking world. He had the American gift of skinning down to the point in the “balloons” ( the hand lettered words in cartoons and comic strips ) as well as in his drawn characters. He has joined the ranks of great native humorists and satirists like Nye and Twain and Riley and future generations will absorb much of the spirit of his lifetime through his quarter of a century of contributions.